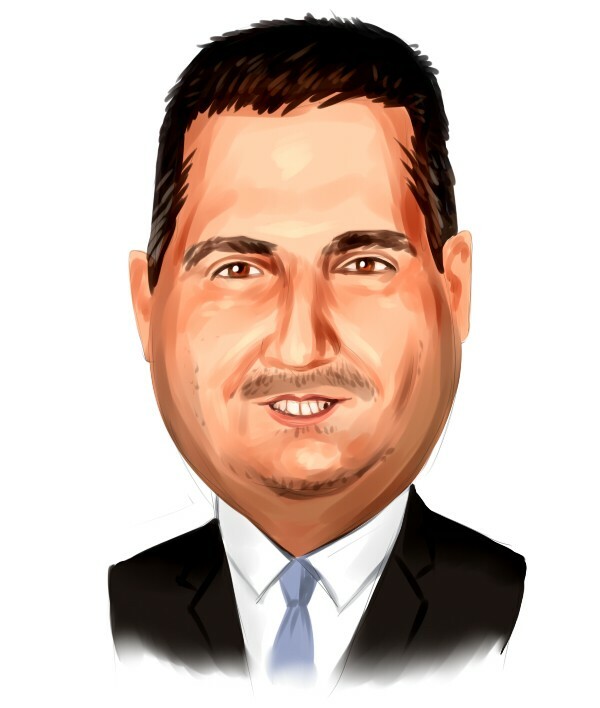 HCA Healthcare (HCA): Are Hedge Funds Right About This Stock? There are several ways to beat the market, and investing in small-cap stocks has historically been one of them. We like to improve the odds of beating the market further by examining what famous hedge fund operators such as Carl Icahn and George Soros think. Those hedge fund operators make billions of dollars each year by hiring the best and the brightest to do research on stocks, including small-cap stocks that big brokerage houses simply don’t cover. Because of Carl Icahn and other elite funds’ exemplary historical records, we pay attention to their small-cap picks. In this article, we use hedge fund filing data to analyze HCA Healthcare Inc (NYSE:HCA). Is HCA Healthcare Inc (NYSE:HCA) the right investment to pursue these days? Money managers are buying. The number of long hedge fund positions improved by 1 lately. Our calculations also showed that HCA isn’t among the 30 most popular stocks among hedge funds. In the 21st-century investor’s toolkit, there are plenty of methods investors put to use to value publicly traded companies. A duo of the most under-the-radar methods are hedge fund and insider trading interest. We have shown that, historically, those who follow the top picks of the elite hedge fund managers can outpace their index-focused peers by a significant amount (see the details here). Let’s take a glance at the latest hedge fund action regarding HCA Healthcare Inc (NYSE:HCA). What have hedge funds been doing with HCA Healthcare Inc (NYSE:HCA)? At the end of the third quarter, a total of 46 of the hedge funds tracked by Insider Monkey were long this stock, a change of 2% from one quarter earlier. 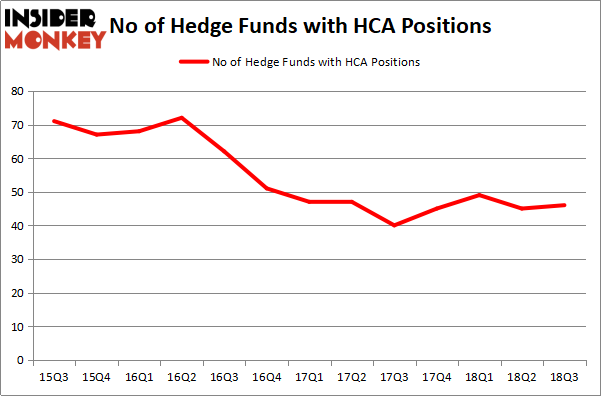 The graph below displays the number of hedge funds with a bullish position in HCA over the last 13 quarters. So, let’s examine which hedge funds were among the top holders of the stock and which hedge funds were making big moves. More specifically, Arrowstreet Capital was the largest shareholder of HCA Healthcare Inc (NYSE:HCA), with a stake worth $606.2 million reported as of the end of September. Trailing Arrowstreet Capital was Glenview Capital, which amassed a stake valued at $603.1 million. Chieftain Capital, Millennium Management, and Citadel Investment Group were also very fond of the stock, giving the stock large weights in their portfolios. With a general bullishness amongst the heavyweights, key money managers have jumped into HCA Healthcare Inc (NYSE:HCA) headfirst. Sivik Global Healthcare, managed by Krishen Sud, created the most valuable position in HCA Healthcare Inc (NYSE:HCA). Sivik Global Healthcare had $7.7 million invested in the company at the end of the quarter. Clint Carlson’s Carlson Capital also initiated a $6 million position during the quarter. The other funds with new positions in the stock are Benjamin A. Smith’s Laurion Capital Management, Paul Marshall and Ian Wace’s Marshall Wace LLP, and Andrew Feldstein and Stephen Siderow’s Blue Mountain Capital. Let’s now take a look at hedge fund activity in other stocks – not necessarily in the same industry as HCA Healthcare Inc (NYSE:HCA) but similarly valued. We will take a look at Emerson Electric Co. (NYSE:EMR), General Motors Company (NYSE:GM), Banco Bradesco SA (NYSE:BBD), and Illinois Tool Works Inc. (NYSE:ITW). This group of stocks’ market valuations matches HCA’s market valuation. As you can see these stocks had an average of 33.25 hedge funds with bullish positions and the average amount invested in these stocks was $1659 million. That figure was $3199 million in HCA’s case. General Motors Company (NYSE:GM) is the most popular stock in this table. On the other hand, Banco Bradesco SA (NYSE:BBD) is the least popular one with only 14 bullish hedge fund positions. HCA Healthcare Inc (NYSE:HCA) is not the most popular stock in this group but hedge fund interest is still above average. This is a slightly positive signal but we’d rather spend our time researching stocks that hedge funds are piling on. In this regard, GM might be a better candidate to consider a long position. Is PotlatchDeltic Corporation (PCH) A Good Stock To Buy? Hedge Funds Are Dumping Gilead Sciences, Inc. (GILD) Hedge Funds Aren’t Crazy About FactSet Research Systems Inc. (NYSE:FDS... Hedge Fund Sentiment Is Stagnant On Portland General Electric Company (POR) Is Motorcar Parts of America, Inc. (MPAA) A Good Stock To Buy? Is The PNC Financial Services Group, Inc. (PNC) A Good Stock To Buy?